The 2013 NFL Draft is quickly approaching. The Denver Broncos currently own six selections (28, 58, 90, 125, 161, and 234) and their positions of need include defensive end, defensive tackle, middle linebacker, cornerback, and running back. So, what is the team planning for on draft day? 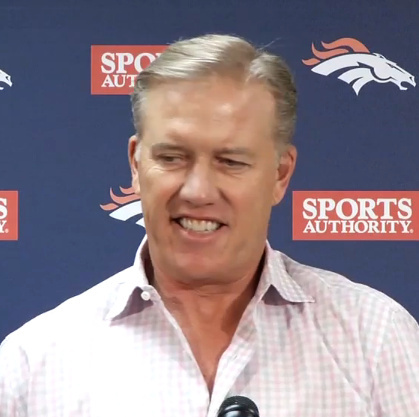 "We're open to anything, (the draft is) so fluid," team executive John Elway told the media during a press conference on Monday (video available on DenverBroncos.com). Elway also noted that it would cost a lot to trade up, but the team hasn't ruled out either trading up or down in the first round. But the most likely scenario for the team is selecting 28th overall. "When you look at the depth of this draft, there are a lot of good football players, so as I stand here now, we'll get a good football player there at 28—that's our plan right now. We'll see how things go from here." Whatever direction the Broncos decide to go, it may not fall in line with popular opinion—but that isn't required. Last year, the "experts" were abuzz about the defensive tackles "rising and falling" on draft boards and projecting one of them to land in Denver in the first round. But as draft day came and went, the Broncos passed on several defensive tackles and didn't even select in the first round, choosing to trade down into the second round. But it should be noted that the myth of "risers and fallers" is just that—a myth. You won't stumble across a war room and overhear any excessive talk of rising and falling. Scout: (Notre Dame's) "Manti Te'o improved his 40-time at his pro day by milliseconds and the major networks are saying his stock is rising." G.M. : "Then we better take him higher than we had previously planned so he doesn't go off the board before the second round." That's not how the process works, according to former Broncos G.M. Ted Sundquist, who says teams value the film above everything else, including the pre-draft process of 40-times, meetings, and everything else. So when the media proclaims that a player is a "reach pick" (being selected too high) or says he is "falling" on draft day, take it with a grain of salt. Often times the media are two steps behind the actual teams making the selections. After all, there is a reason that those folks are on TV and the executives, scouts, and coaches are in their respective war rooms—they are good at their job. Denver's Elway is particularly good at his job. Of the sixteen draft selections the Broncos have chosen since Elway took over football operations two years ago, fifteen of them are still with the team. Those fifteen players have combined to play in 250 games since 2011, led by defenders Von Miller (2nd overall in 2011) and Derek Wolfe (36th overall in 2012), who both started in all sixteen games last season. Among the positions that Elway and the Broncos will look to address through the draft this weekend appears to be running back. Michigan State's Le'Veon Bell is one of the backs that has caught Denver's eye, but Elway was coy when asked about the team's plan for the position on Monday. And fifth-year running back Knowshon Moreno? There was no mention of him, which could be telling. Elway gave McGahee a mini-endorsement, but that should also be taken with a grain of salt. Last February, Elway told reporters that quarterback Tim Tebow was, at the moment, "our guy." One month later, circumstances changed when Peyton Manning hit the free agent market. The Broncos went after Peyton, and landed the Super Bowl-winning QB. In a matter of days, Tebow went from being the Broncos' "guy" to being traded out of Denver. But Elway was being honest. At the time, Tebow was their guy—until a better option became available. Right now, McGahee is Denver's RB—until a better option becomes available. If the Broncos land a running back in the draft that they feel can carry the load for them moving forward, McGahee may lose his starting job, or even be cut. But as of today, he is Denver's "big back." In their history, the Broncos have drafted 68 running backs, using more selections on their backfield than any other position. Syracuse halfback Floyd Little was the franchise's first selection back in 1967 (sixth overall). More recently, the team selected Moreno, a former Georgia Bulldog, in the first round (12th overall) in 2009. There will be plenty of opportunities to draft a running back this weekend, whether in the first round or later in the draft. Alabama's Eddie Lacy, Wisconsin's Montee Ball, and Bell are just a few of the most intriguing prospects. The first round of the 2013 NFL Draft will take place in two days on Thursday, April 25 at 8 p.m. ET and will be televised on NFL Network and ESPN. The final six rounds will take place on Friday and Saturday.